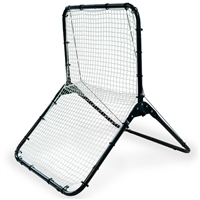 Features an 18 gauge steel frame for ultimate durability. The sleek, black finish not only looks cool, it also serves as a protective barrier against the elements. 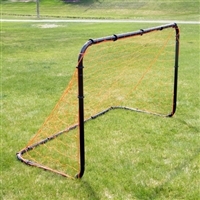 This goal includes 20 C clamps to easily attach the orange poly net to its frame. 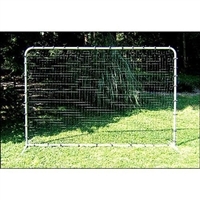 It also comes with four J anchors that hold the goal securely in place against even the most powerful shots. Set up and tear down are quick and easy too. This strong 1.5-inch, 18-gauge steel frame can withstand even the most punishing slap shots. The goal is great for both indoor and outdoor use. 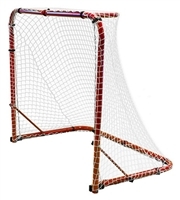 The highly visible red frame supports a white bungee slip net that will stay secure throughout the longest afternoons of play. 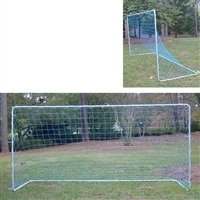 A set of eight poly C-clamps allows you to adjust net configuration, and two U-anchors are included to make this net useful for any manner of game play. convenient storage and requires no tools to assemble. 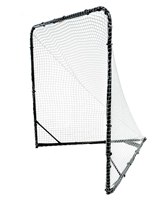 The durable Park & Sun Sports Lacrosse Goal is easy to use. With its easy-to-use push-button system, you won't waste any time assembling the Lacrosse Goal. The Bungee Slip NetTMmakes set-up that much quicker by simply slipping over the frame in mere seconds. The entire product is ready to use in minutes! netting. It easily assembles without tools. 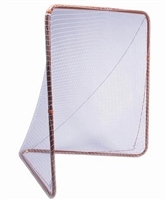 This versatile, folding lacrosse goal pops up in minutes, wrapped in a Bungee™ slip net designed to catch every shot. With a sturdy 1.5-inch tubular steel frame and 4 ground stakes, this is a goal that stays in place no matter what you throw at it. Assembles and disassembles with the easy tightening knobs.